Using muliple techniques, our skilled artisans carefully hand-distress every door so each one is unique. Next, a dark burnishing stain is carefully brushed onto corners and select raised areas. Finally, after a stain is applied and hand-rubbed into the wood, a durable matte Suede topcoat is used to complete the distressed look. 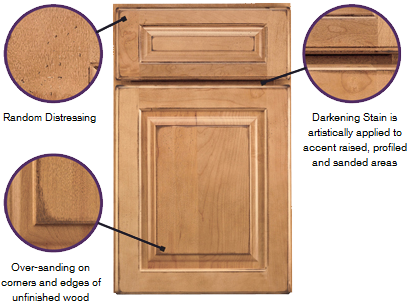 Distressing effects - including edge rasping, worm holes, cow tail, edge burnishing, softened corners, and industrial distressing - are inconsistantly hand-applied, replicating the look of distressed wood that has been re-purposed.